Free Printable 4th of July USA Flag Pencil Craft. Free Printable 4th of July USA Flag Pencil Craft, a fun activity for Independence Day celebration. 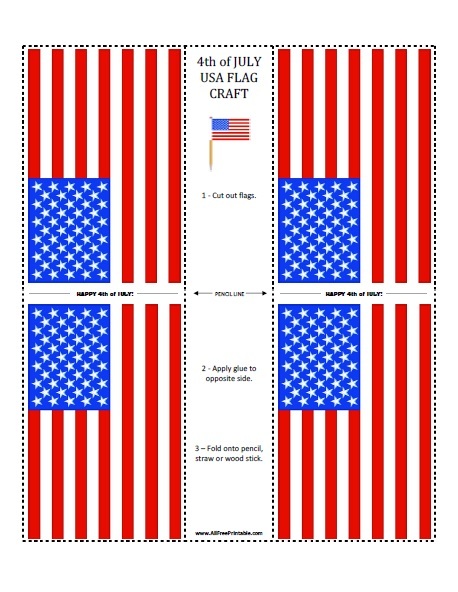 Share this free printable 4th of July USA Flag Pencil Craft at school, summer school or at home. Your kids can make their own USA Flags for 4th of July. To make the Fourth of July Flag you just need a printer, paper, pencil or straw, scissors and glue. Print the template, cut out the 2 flags using the dotted lines, fold the flags down the center pencil line, put glue and align the pencil exposing only the eraser, press the 2 sides of the flag and let it dry. Print this 4th of July USA Flag Pencil Craft free and share with your kids and students. Happy 4th of July! Thank you so much for sharing this fantastic web-site.